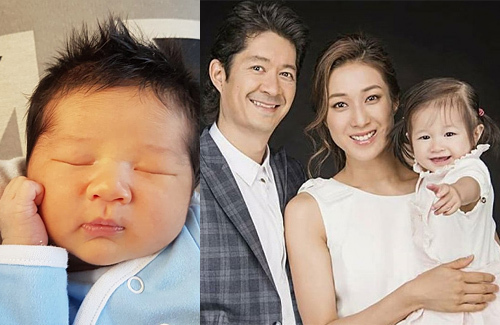 Linda Chung (鍾嘉欣) shared photos of her new baby boy, Jared Anthony, on Instagram today. Linda revealed that she had a natural birth at her home in Vancouver, and Jared weighed a healthy 7 pounds and 14 ounces when he was born. Linda wrote, “To our son, Jared Anthony Leung. Welcome to our family. We love you.” Tagging the photo #leovirgodog, Linda indirectly revealed that Jared was born in mid to late August time frame. “He has a lot of hair and resembles Kelly closely. My family joked that I had fraternal twins because they look so much alike,” Linda said. Both Kelly and Jared inherited prominent noses from their parents, but daddy’s traits seem to be more evident. Good friends, Grace Wong (王君馨), Eliza Sam (岑麗香), and Leanne Li (李亞男) were thrilled by the baby news. Grace said, “I’m very happy for Linda! Since the baby was born at home, I felt Linda was very brave! Haha! Linda is slowly realizing her dream because she loves children and really wanted to have a second child,” Grace said. 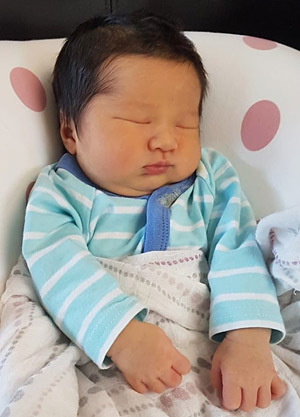 Married to Canadian-Chinese chiropractor, Jeremy Leung, Linda returned to her hometown in Vancouver to raise their family. After giving birth to her daughter, Kelly, in 2016, the 34-year-old actress has reduced her workload and eventually left TVB this March. Embracing motherhood fully, Linda is extremely excited that Kelly will now have a little brother to play with. cute, looks like a big newborn. Waaah so brave. Home births! Congratulations to Linda & family! Such a cute and adorable baby boy. By the way, nice to see Linda & Tavia in Another Era. I hope the ex-fadans would continue to appear onscreen/in series once in a while. so glad Linda left TVB, she was a horrible actress. and home births are very normal in Canada, a lot of people has a mid-wife and decides to give birth at home instead of at a hospital, it’s a choice and covered by government. @parisnights That is a very good system. We are stuck with poor NHS services here. @parisnights she cannot act and her role in tiger cubs was like a bull dog. she does very well for roles which require her to cry. now that she has 2 young kids, we will be free from her. next one to leave TVB should be grace chan.